The newly launched drink may provide a novel way to consume collagen aside from the usual capsules available in the market. The beauty and cosmetic industry markets collagen because as people get older, they lose this valuable component, resulting in lack of firmness and wrinkles. The alcoholic drink named Anti-AGin, was developed by the UK-based Bompas and Parr, that creates food art using gelatin desserts. The 40 per cent spirit is a combination of chamomile and tea tree scents. Other ingredients include witch-hazel, nettle, juniper, coriander and angelica root, the Tech Times reported. 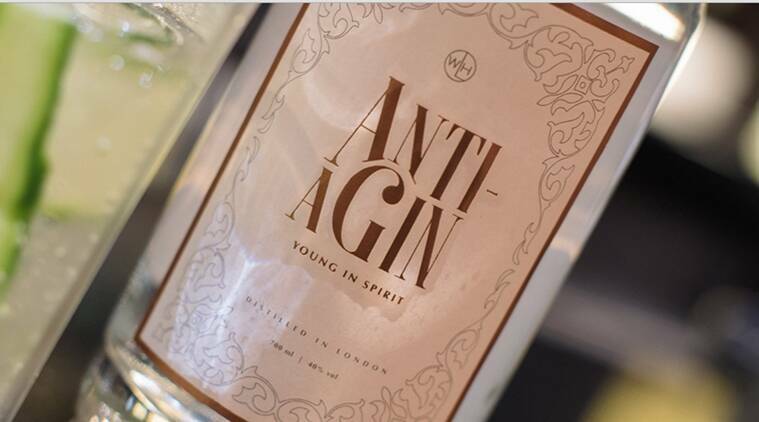 The ingredients were specifically chosen due to their revitalising qualities, including healing sun-damage, being rich in minerals, inhibiting scar formation and to help smooth cellulite, Warner Leisure Hotels, which commissioned the drink, wrote in its website. Collagen is naturally produced by the body, but as people age, its production diminishes. Taking in products with collagen or using beauty products with it, could help reduce wrinkles and other signs of premature ageing on the skin. If you spotted another wrinkle this morning, don’t despair. Research shows that crow’s feet and other crinkles don’t always age us. In fact, roughly half of us are blessed with genes that make them look two years younger than others despite having wrinkles. Experts have found that it is the same gene responsible for red hair and fair skin, and those who carry it looked an average of two years younger than they were. The downside is that the other half have DNA that can age their skin as much as smoking. Genes come in pairs and around 6 per cent of people studied were born with copies of the ‘ageing’ gene, meaning they look two years older than those who don’t have it at all. Another 43 per cent have one copy of it and so look one year older. But the other half is lucky enough to not carry it at all and stay baby-faced for longer. Further analysis showed those who had been aged by the gene didn’t have any more wrinkles. Nor were they any more likely to be sunworshippers than the others. Just how the gene ages us is still a mystery but the scientists said it might fuel a combination of features, including age spots, red veins and loose, saggy skin. If you have these features, you may be unlucky enough to have a pair of the genes. On 22nd June 2015 we released an updated age progression of missing person Steven Cook. Steven Cook went missing in Malia, Crete, on the night of 31st August / September 1st 2005 on the first day of his holiday. Thewebsite his family have created is dedicated to bringing Steve home, telling people about their search for Steve, his possible circumstances, and informing anybody that is going to holiday in crete, or knows someone that may live there, how they can help to bring Steven home through sparing just a few minutes of their time whilst there. Below are photos of Steven before he went missing. We are all aware of the damaging effects of alcohol on our liver, but do we ever consider the effect it has on our looks. #AAW15 is now upon us and before the Christmas festivities begin, is a good time to cut down and think about drinking a little less than usual. The effects of alcohol on the way we age, are as follows: weight gain – not only is alcohol very calorific but we often find the very next day, we’re gorgeing on fry up breakfasts and carbs to rehydrate and re-energise. Excessive consumption of alcohol also dilates the blood vessels in skin, creating the red cheeks and ‘strawberry’ nose so associated with drinking. Bloodshot eyes and deepened wrinkles are added factors as alcohol accelerates the ageing of our skin. Some of the people you went to high school with look like they havent aged a day since graduation. Others look like they could already be in a retirement home. A long-term health study of about 1,000 young adults in New Zealand now has some of the answers to uneven aging, as published today in the Proceedings of the National Academy of Sciences. The group was analyzed for 12 years, from the age of 26 to 38. A set of 18 biological markers were used to determine the relative pace of aging. Factors included traditional blood pressure and liver function, but also added function of other vital organs such as the kidneys, lungs, metabolic and immune systems, as well as the length of their telomeres, the ends of the chromosomes which shrunk with age. The 38 year olds varied from biological aging under 30 years, to nearly 60 years of relative age, according to the markers which might point a way to offsetting the years. We set out to measure aging in these relatively young people, said Daniel Belsky, an assistant professor of geriatrics at Duke Universitys Center for Aging, and the first author. Most studies of aging look at seniors, but if we want to be able to prevent age-related disease, were going to have to start studying aging in young people. Most of the group in the Dunedin Study, which tracked people in the same New Zealand town born in 1972 and 1973, were aging at an average rate of about one year per year. But some aged at a rate of zero years and for the rate was as great as three biological years per 12 calendar months, they found. Those who aged faster within were also considered older-appearing to college students, and also had corresponding physical and cognition difficulties compared with their younger counterparts. It wasnt all genes, the scientists concluded pointing to previous twin studies which find only 20 percent of aging is attributable to natural inheritance, they found. That gives us some hope that medicine might be able to slow aging and give people more healthy active years, said Terrie Moffitt, a Duke professor of psychology and neuroscience, and senior author of the study. Richie Poulton, the Dunedin Study director, says that being able to detect accelerated aging at an early stage paves the way for proactive treatment of age-related ailments. Currently, we are largely stuck in an ambulance at the bottom of the cliff situation, Poulton said. And by 2050, the world population aged 80 years and over will approach 400 million people, so we are facing an enormous global burden of disease and disability unless we can extend healthy lifespans. Scientistsbelieve they have identified a group of genes that allow some people to look far younger than their true age. A project involving almost 1m people led by scientists at Harvard University and 23andMe, a private genetic database, found that 10% of white and 20% of black Americans carry the genetic recipe for youthful skin. The researchers believe its presence can result in people looking up to 10 years younger than they really are, potentially explaining the youthful appearance of celebrities such as the actress Halle Berry, 48, and the model Iman, 59, the wife of the musician David Bowie. Some of the findings are being presented this week at the World Congress of Dermatology in Vancouver, Canada. More details will appear in a series of publications including the Journal of Dermatology later this year. Everything you have been exposed to over your lifetime, where you grew up, the food you eat, even the toiletries you use: this is your exposome, and can affect not only your health but perhaps that of your children and childrens children. With environmental health scientist Frank Kelly, geneticist John Parrington and biologist Hector Keun, I found outmore about this incredible world of epigenetics, and how life can affect your genes. Aparently the heart you are born with is not the heart that you will die with (in older age) as the cells are constantly being replaced.The environment has such an impact on your body, that cells for example start to remember if you smoke, or live in a polluted environment, the food you eat and they adapt and are then passed on to your children. Studies have compared children who are brought up in priveleged and less priveleged environments, and this does actually play a part in the way your body evolves. Therefore, reinforcing that smoking, drinking, pollution, sun exposure, stress, lack of sleep and diet all play a part in the way your body ages and reacts to disease. It’s enough to know that with smoking drinking, a poor diet and little exercise can damage our health and looks but did you know that if you breathe in diesel fumes and live in a polluted area, this can also accelerate the ageing process? We recently made an app for Toyota and Lexus Fleet Services to show their customers how much better they could look if they lived in a ‘Hybrid’ world. You can find it for free here – see how you could look, the results are dramatic. Download Fume Face Herefor free.